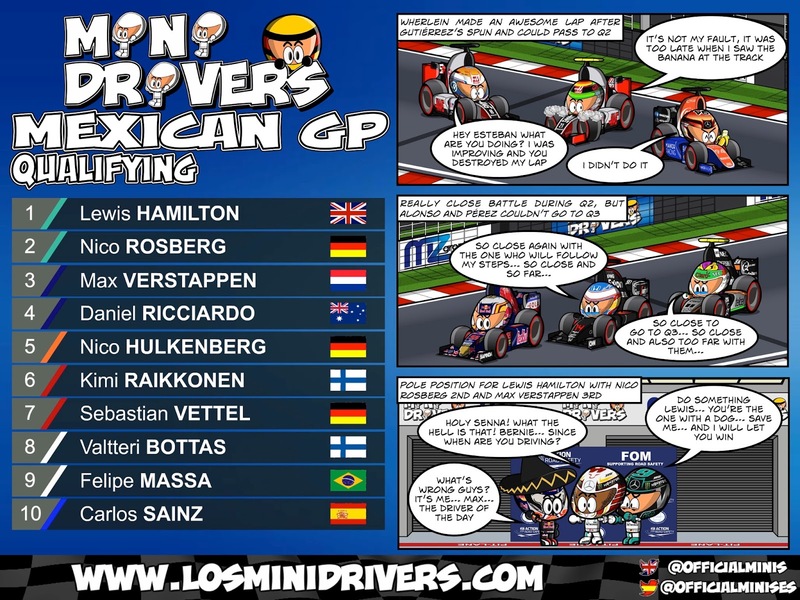 Mexico is back for his second year for the Formula 1 Mexican GP. The Autodromo Hermanos Rodriguez has again a great ambience for one of the most expected races of the season. Sergio Perez and Esteban Gutierrez wanted to bring the best for their fans and we just saw the qualifying session. Wanna know what happened? Keep reading! Time for the first session of qualifying and both Haas were the first team to check the Mexican track, but the Toro Rosso were faster than them. but when the top teams arrived we saw Vettel on top with Hamilton really close to him, and Pérez just behind them at half of a second, but Raikkonen took the first position with 3 tenths of difference. Red Bull also were faster than the Mercedes with Ricciardo between Kimi and Vettel. Hamilton started to bring the power with his Mercedes and make the best time just with 1 tenth ahead of the Ferrari driver. The Sauber, Haas and Manor were at the knockout zone and they tried to make a better lap, something that Gutiérrez made, making Kvyat to fall at the knockout zone. Chequered flag and Lewis Hamilton made the best lap of Q1 and at the knockout zone we had Gutiérrez, Kvyat, Nasr, Ocon and Grosjean. Second session of the qualifying and as we saw last week, the Mercedes boys were using the soft tyre for their qualifying lap, something that we saw with a lot of drivers this time. Vettel blocked Hamilton at the end of his lap, but the british driver made the best time… but Verstappen made the best time with the super soft tyre. Chequered flag and Verstappen took the best time and at the knockout zone we had Alonso, Pérez, Button, Magnussen, Ericsson and Wehrlein. Last battle for the qualifying and we can’t make a bet about who will get the pole position. Verstappen and Ricciardo made a great lap taking the first positions, but the Mercedes boy arrived and Hamilton took the provisional pole position, but Rosberg was 4th, behind the Red Bull boys. Everyone went to boxes and prepared for the final lap of Q3. Who will get the pole position? Lewis couldn’t improve his lap time, but Rosberg could overtake both Red Bull taking the 2nd position with both Red Bull behind him with Verstappen and Ricciardo. The top 10 was completed by Hulkenberg, Raikkonen, Vettel, Bottas, Massa and Sainz. Tomorrow we will have a really interesting race with a great battle with the Mercedes boys, but we must look after the Red Bull, who could make an awesome start. The bets are open… Who will win tomorrow? See you MiniFans and remember… Be mini-good!